Lower South Hall at the SEMA Show is home to the Global Tire Expo, where more than 200 exhibitors feature their products. In addition to tires for cars, trucks and off-road applications, the section includes accessories and equipment related to tire-pressure monitoring systems and repairs. While tires may at first seem unremarkable, a survey of the New Products Showcase makes it clear that innovation is taking place all over the segment. Among the products honored in the New Products Awards, Cooper Tire took home the Best New Tire-Related Product award for its all-terrain Discoverer AT3 4S, while an off-road entry by Mickey Thompson and a winter tire by Continental were runners-up. Cooper Tire also garnered a runner-up accolade for its Discoverer AT3 360 Interactive Display in the Merchandising Display category. The following pages include the tire entries from the 2018 New Products Showcase. The VT56 is an all-in-one diagnostic TPMS tool with relearn coverage for domestic, European Union and Asian vehicles. Patented new Sync-ID technology allows OE-compliant OBD relearn coverage for domestic and European vehicles, eliminating long and complicated manual reset procedures. Read a vehicle’s make, model and year in seconds using the VIN scan barcode reader. This tire is ST rated for trailer use, with construction that’s designed for heavy loads carried at a higher center of gravity. High-load-index applications made for utility, recreational and work trailers. The interlocking shoulder and inner tread blocks improve traction while also providing a quiet ride. The tire is rated for up to 75 mph. 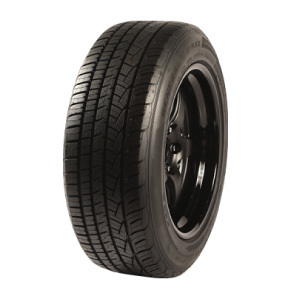 The unique compound and tread design of the AZ850 were specifically engineered for the contemporary performance utility vehicle. The result is a rubber compound that helps reduce rolling resistance, which in turn allows the tire to run cooler at high speed. High-tensile steel belts and jointless nylon bands increase stability at high speeds. The Tech1000 features a full-color, brightly lit touchscreen. First and foremost, the Tech1000 is a high-powered TPMS service tool. Quickly scan the vehicle identification number with VINDicate, or use the state-of-the-art barcode reader that can read all forms of barcodes, not just 1-D.
AutoMeter’s precision 60 PSI Glow-in-the-Dark Tire Pressure gauge features a large 2.25-in. dial face for easy viewing, sure-grip rubber shock isolation boot, pressure-bleed valve, 20 in. rubber hose, angled chuck, and includes a protective storage case. The TrueContact Tour is a touring tire and features a 27% improvement in wear over the segment-leading previous-generation TrueContact tire. It is designed with Continental’s Comfort Ride Technology, which reduces road vibrations and provides for a quiet ride. The Signpost Series Tire Tongue is a temporary-use sign holder that lets users quickly attach a label, invoice, flyer or other types of product info to tires of nearly any size in stacks or racks. Marking a stack of truck tires as sold? Insert the invoice into the clip, then slide the tire tongue between the top two tires with the invoice hanging down. A special directional and extra-deep tread design delivers excellent traction in wet and muddy conditions. Excellent self-cleaning tread pattern for mud removal. Cut-, tear- and chip-resistant compound. Strong casing for extra durability and long service life. The TruStack tire dolly is a round, high-capacity platform dolly offering a stable way to fetch, stow or display barrel-stacked tires. Reduce back strain and labor cost by eliminating repetitive restacking. Reduce personal and property risk from tipsy indoor/outdoor displays. Features easy-guide mobility, a fetch handle and an innovative anchor system. This ultra-high-performance all-season tire is designed for law enforcement fleets and high-speed pursuit applications. The G-Max Justice provides a durable tire with technologies that offer precise handling, all-season traction and a longer tread life.